Home Mens Hair	Does minoxidil work? 6 facts you need to know before you use it! Does minoxidil work? 6 facts you need to know before you use it! Certain treatments such as Minoxidil 2%, Minoxidil 5% and Finasteride are capable of slowing or stopping hair thinning. As well as help hair regrowth you probably thought was long gone. Although these treatments aren’t a saviour for lost causes. Those of you effected by the early signs of hair loss can combat it with Minoxidil. Worldwide men are using Minoxidil to solve their hair loss woes. Although minoxidil begins working immediately, it can take several months to produce noticeable results. Minoxidil is a medicine licensed in the UK as a hair loss treatment for men and women. Because it does not require a prescription, it is available from many high street pharmacies. In the Uk the most popular brand is Regaine. It’s US equivalent is as Rogaine who were the first to patent the formula. Minoxidil is a treatment that not only stops hair loss but also builds a good environment for hair to regrow. It is widely used by both men and women. Minoxidil is unlike other hair loss drugs, this treatment work by creating an ideal growth environment for your existing hair follicles. Unlike finasteride which blocks DHT (Dihydrotestosterone) to stop hair loss. It’s sold as a liquid or foam and in two strengths: 2% and 5%. It is not used for baldness at the front of the scalp or receding hairline in men but the patches elsewhere. Minoxidil manages to stimulate shrunken hair follicles, but not completely bring old ones back the dead. For this reason, Rogaine is not meant for all types of hair loss. For loss of hair around the crown, it could do a lot of good. Rogaine is not recommended for men with a receding hairline. That is not what this product is meant for. Applied every day, twice a day, for several months, this medication can help hair become thicker more full. Minoxidil would also be a good idea for those of you that want a full and thicker beard. As the formula treatment can be applied to patchy areas it would work exceptionally we on facial hair. When applied topically in the form of a serum or foam, minoxidil increases blood flow to the parts of your scalp where hair grows. By increasing blood flow, more oxygen and nutrients are able to be transported into each hair follicle, promoting growth and hair health. 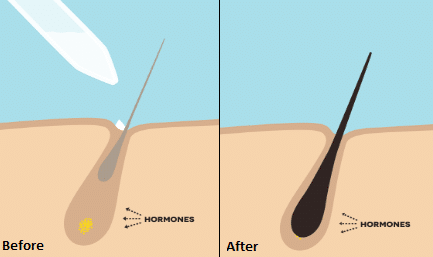 Most other hair loss products manipulate the hormones. Unlike finasteride, which works by reducing the levels of DHT in your bloodstream, minoxidil has no known effect on your hormones. It’s best to think of minoxidil as a local solution that can help improve your hair growth, while finasteride is designed to shield your follicles from DHT. Minoxidil is a vasodilator, meaning it’s designed to dilate blood vessels and improve the flow of blood to certain areas of your body. Minoxidil works for about 2 out of 3 men. It’s most effective if you’re under age 40 and have only recently started to lose your hair. Products such as minoxidil, shorten the telogen phase and causes old hairs to shed and be replaced by fresh, new hairs in the anagen phase. It’s important to know that you can only regrow from areas where the hair follicles are still active, healthy and capable of producing new hairs. From start of application to 1 month you will begin to see more hair loss than you already had. Don’t be alarmed this is the minoxidil shortening the telogen phase. So it may appear like growth has stopped completely. Not long after your telogen phase has halted. Which varies for everyone. But by the 2nd month of application your hair will have stopped falling out. You will see small amounts of growth as your hairs come out of the exogen or shedding phase. This means your hair is preparing for new growth. By 3 to 4 months of application users should start to see some sort of progress in regrowth. By this time your hair will enter back to the anagen phase in which your hair follicles should be rejuvenated from the treatment. Making it possible for thicker healthy hair to grow. By 4 to 6 months you should see much improvement from your first application. Your hair will be in the peak of its growing phase and you should see results by this time. If not contact your doctor, but bare in mind. Minoxidil is not a cure for hair loss. Though it will recoup your hair, the hair regrowth you have made will stop when you stop applying so you will need to keep application going indefinitely. What is the Difference Between 2% and 5% Minoxidil? The original concentration of Minoxidil that was approved by the FDA for the treatment of hair loss was 2%. It was a water-based solution. The results that could be obtained in terms of regrowth of lost hair and even in terms of maintenance of existing hair for sufferers of androgenetic alopecia was limited at best with this concentration. Eventually a higher concentration of Minoxidil, 5%, was developed based in alcohol and propylene glycol. 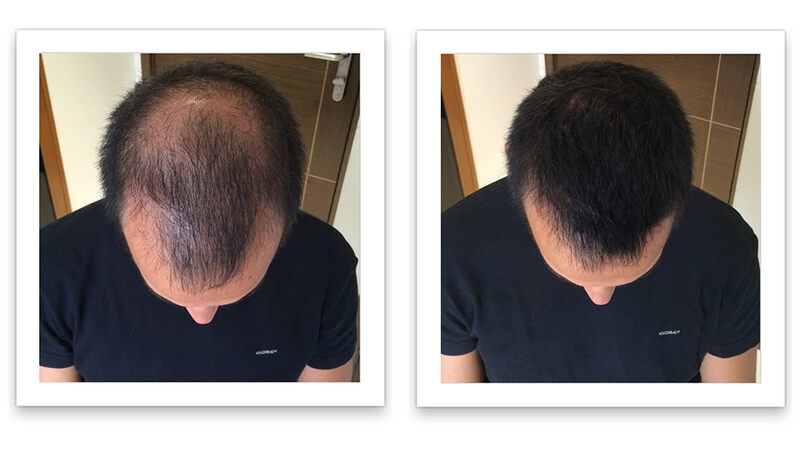 5% Minoxidil solution was found to be more effective that 2% in maintaining existing hair and regrowing lost hair. However the disadvantage of using a 5% Minoxidil solution is the increased chance of side effects. It is advised that 5% is reserved for the use of men. The two products which Rogaine is currently offering for men are A) unscented foam and B) extra strength (aka liquid) Rogaine. Both of these are in essence 5% Minoxidil, but with different inactive ingredients. Women only have the option of the liquid version, and it is very important that each gender use their appropriate method, since the ingredients are somewhat different. Rogaine were the first to patent the formula but now there are various generic Rogaine brands that provide a product just as good at a affordable price.But you can also find generic rogaine versions. 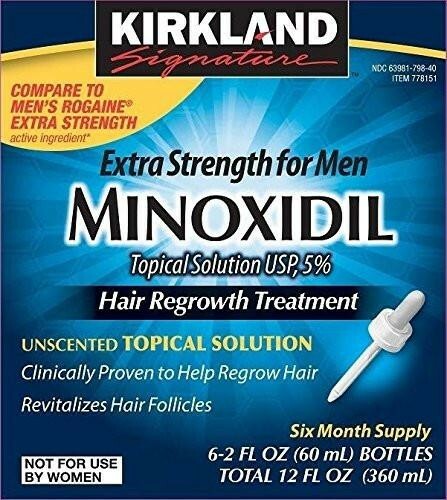 One of the most popular generic brands is Kirkland (Costco) Minoxidil 5%. The difference? Not much. The active ingredient minoxidil is the same. The main thing you will notice is that each generic brand varies when it comes to inactive ingredients. This can make consistency the difference and some say that the minoxidil Kirkland is greasier, in comparison to the Rogaine formula which reviews say is dry. However the one that works for you will mostly depend on preference or hair type. click here to view products on Rogaine website. The higher concentration is usually only recommended for use by men and is labelled by Regaine as Extra Strength for Men. To have any positive effect upon hair loss, Minoxidil must be applied at least once a day, every day for as long as treatment is desired. The method of application will differ depending on whether you are using lotion or foam, but the basic technique is to apply a small amount (usually 1ml) very carefully to areas of the scalp affected by balding and to massage it into the skin. If you are using liquid Minoxidil, it is likely that you will be provided with an applicator to make the process easier and more accurate. By applying the product to patches on the scalp, this treatment will help reignite your hairs follicle thought. It is important not to apply Minoxidil to irritated or sore skin and to avoid getting it in your eyes. Minoxidil can also lead to unwanted hair growth if it comes in to contact with other areas of the body. Minoxidil is second only to Finasteride. 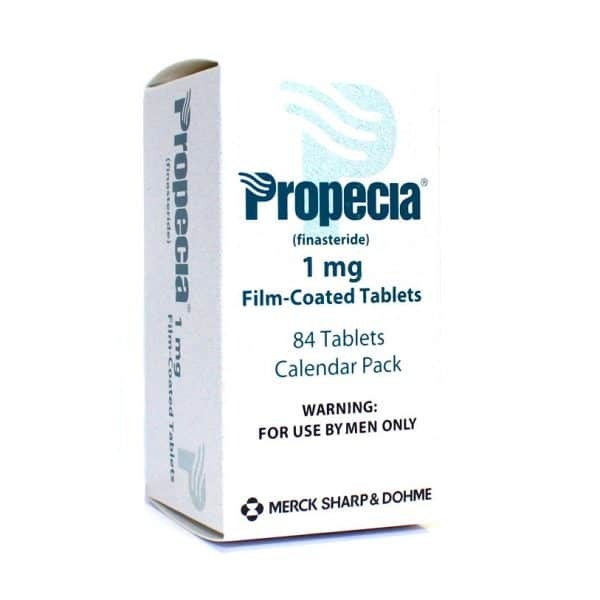 Finasteride is a tablet taken every day to combat male pattern baldness, and is branded in the UK as Propecia. Similarly there is Loniten which is also a tablet hair loss treatment. However Propecia Hair loss tablets must not be taken by women. Finasteride can cause birth defects if a woman is exposed to it during pregnancy. It is the leading hair loss fix for men. Propecia was shown to be effective at halting hair loss and promoting regrowth in 90% of men who used it. Biotin (B7) Biotin is vital to many body functions. According to the University of Maryland Medical Center, vitamin B7 is used by the body to metabolize carbohydrates, fats and amino acids. Many people take biotin supplements to increase the health of their skin, hair and nails. Some guys aren’t ready to commit to the long process of applying formula to their hair everyday and taking a vitamin-complex tablet once a day is something which comes more naturally to them. Shampoo, often anti-hair-loss shampoos contain elements similar to Minoxidil, which inhibit the overproduction of testosterone some popular hair loss brands offer a shampoo like Rogaine shampoo. However, since the cause of hair loss is not always connected to hormones, it may not be the treatment for you. But people see shampoo as a more natural solution, since they are used to washing their hair anyway, and usually on a daily or semi-daily basis. Minoxidil shedding, Any positive effects upon hair loss will be reserved once you stop treatment. Typically, hair loss will resume as normal after 3-4 months of ceasing treatment with Minoxidil. For this reason, Minoxidil should not be thought of as a hair loss cure, but as a temporary solution. When you stop using the product it will bring back hair loss. It won’t rescue a receding hairline. It does stimulate hair growth in other areas but is not a cure for complete baldness. Is Rogaine safe? Yes, but one of the Rogaine side effects is mild skin irritations. If you experience any side effects you should stop using Rogaine and tell your doctor or pharmacist. It’s sold as a liquid or foam and in two strengths: 2% and 5%. 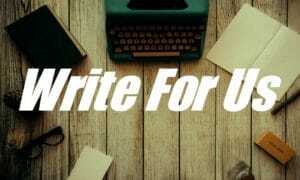 5% is the concentration that is usually recommended for men. As Minoxidil active products like Regaine can be used by both men and women. Products like Rogaine and Regaine take up to 6 months before you see evident results. If you are deciding to use the product, we recommend using it for the full time period as the product will cease hair growth when application stops.